The balance of the universe has been upset by the entrance into the earth's atmosphere of a brilliant meteorite. The people are totally unprepared for the shock of seeing a three-headed monster with wings, flames spewing forth from its multiple mouths, emerge from the fireball from outer space. It is GHIDRAR! Its giant wings lift it into flight as it soars off to ravage the planet Earth. Godzilla and Rodan are reactivated from hibernation because of this upset in the balance of the universe. Royal Princess Salno of Selgina, a small country between the two worlds, appears before the unbelieving people as a beautiful Prophetess (EIKO WAKABAYASHI) and proclaims herself to be a Martian. Naoko (YURIKO HOSHI), an enterprising girl reporter, is the only person to befriend her until Detective Shindo (YOSUKE NATSUKI), the reporter's brother, takes her into protective police custody to guard her against a group of thugs, headed by Malness (HISAYA ITO) who are determined to kill her. the prophetess to Mt. Fuji where Ghidrah does battle with Godzilla, Rodan and Mothra, the massive caterpillar who comes to their assistance. 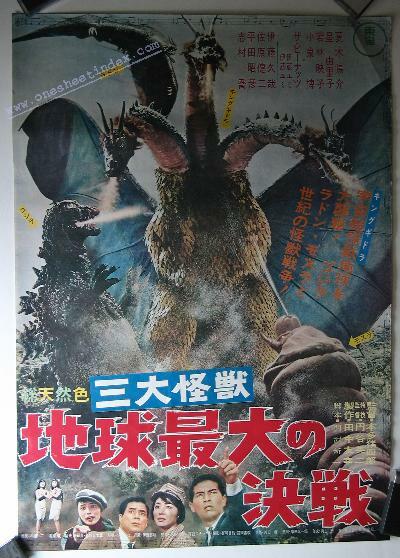 Produced by Toho Co., Ltd.
San Daikaiju: Chikyu Saidai no Kessen (released in the U.S. in 1965 as "Ghidrah the Three Headed Monster"), the 1964 Ishiro Honda Japanese Toho battling rubbery monster science fiction thriller ("The three-headed monster battles Godzilla, Mothra, and Rodan for the World! "; "All new sights! All never to be forgotten! See GHIDRAH created from an atomic fire-ball! SEE Godzilla come from the depths of the ocean to bring terror to the world! SEE Rodan awaken to monstrous life in volcanic fires! SEE the world quake before the unleashed fury of the battle of monsters! SEE unimaginable terrors the will never be equalled!") starring Godzilla (king of the monsters! ), Ghidorah (the three-headed dragon monster), Mothra (the giant moth monster), and Rodan (the flying monster), as well as Yosuke Natsuki, Yuriko Hoshi, and Hiroshi Koizumi.